South Korea has confirmed that a second hostage has been killed by the Taleban in central Afghanistan. The foreign ministry identified the latest victim as 29-year-old Shim Sung-min, a former IT worker. His body was found at the side of the road in the village of Arizo Valley in Ghazni province. He had been shot. Shim Sung-min was one of 23 Korean Christian aid workers - 18 of them women - seized on 19 July. The body of their leader was found last Wednesday. A man claiming to speak on behalf of the Taleban said the militants had killed the Korean hostage on Monday evening because the Afghan government had refused its demands to release eight jailed militants. Earlier, a video of the hostages was aired on Arabic TV station al-Jazeera. Confirming the death, the South Korean foreign ministry said: "We cannot contain our anger at this merciless killing and strongly condemn this." Spokesman Cheon Ho-sun warned that the Seoul government would not "sit idly by and watch" the lives of its citizens being taken. "We will ensure they take responsibility for the lives of our people," he said. 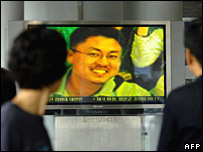 The aid workers' leader, Pastor Bae Hyung-kyu, 42, was the first to be shot dead by the militants. His remains were repatriated on Monday to South Korea, where the families of the remaining hostages are holding vigils near Seoul for the release of their loved ones. A hostage video broadcast by al-Jazeera on Monday showed about seven women wearing headscarves with what appeared to be Taleban militants in the background. The captives looked frightened but unharmed in the brief, shaky footage. The group was riding on a bus 12 days ago through Ghazni province on the Kabul to Kandahar highway, when they were abducted. The BBC's Alastair Leithead in Afghanistan says the latest killing raises the stakes, piling pressure on Afghan President Hamid Karzai to save the remaining 21 captives. But Mr Karzai has refused to swap prisoners for hostages after he was criticised for releasing five Taleban members from jail in March in exchange for an Italian reporter. A delegation of tribal elders, mullahs and members of parliament has been negotiating with the Taleban for the last few days to help secure the hostages' release.